Among the many (presumably) unintended consequences of the “war on drugs” has been a well-documented—and significant—increase in the prison population in many countries for drug-related offenses. Prisons are bursting at the seams across the Americas, and a driving force behind this crisis are harsh drug laws. Research shows many of those arrested or incarcerated for drug offenses committed minor, nonviolent crimes or were simply charged with possession. Drug courts in the United States are presented as an alternative to incarceration for people arrested for minor drug offenses where drug use is considered an underlying cause of the crime, thus theoretically serving as a tool for reducing prison and jail populations. The United States has nearly thirty years of experience with these courts, which have spread to all fifty states as well as US territories. Many countries around the world have looked to the United States’ experience with drug courts as a model to be adopted, and the US government has also promoted them abroad as an alternative to incarceration. Perhaps the most organized efforts to expand this policy are those currently underway in Latin America and the Caribbean. The considerable influence of the United States on the region’s drug control policies has certainly encouraged many of its countries to view drug courts as such an alternative, and the growing number of countries implementing them signals that these efforts are moving ahead with full force there. Proponents of drug courts assert that they are cost-effective; they reduce recidivism as well as time spent in detention (prison or jail); and they offer drug treatment as an alternative to incarceration to people whose drug use fuels their criminal activity. To evaluate these assertions, this report reviews key findings from the United States’ experience which, despite major institutional, legal, and cultural differences, may usefully inform debates about drug courts, along with other alternatives to incarceration for low-level drug crimes, in other countries—in particular, in countries in Latin America and the Caribbean that have either established, or are looking to establish, drug courts. 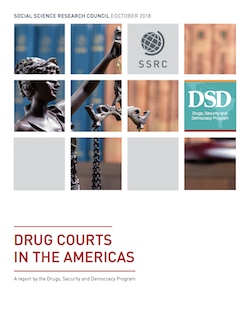 This report also presents a brief overview of where and how drug courts have been implemented in Latin America and the Caribbean to identify, to the extent possible, the different experiences and challenges faced by those countries. Defendants remain in criminal proceedings at every step in the drug court program, risk incarceration, both as a sanction while in the program and for failure to complete it, and, in some cases, spend more time behind bars than they would have had they chosen to pursue criminal justice proceedings instead of drug court. By requiring them to plead guilty as a condition of getting access to drug court. By processing discretionary crimes that police might have not enforced had drug court not been an option. By mediating treatment through the criminal justice system. Drug court judges maintain control over treatment decisions for drug court participants, in some cases ordering treatment that is at odds with accepted medical practice. Participants who fail drug court risk incarceration and face abrupt interruption of treatment and other health risks attendant to incarceration. Access to treatment comes at the cost of forfeiting fundamental legal and human rights. Drug courts point to drug dependence as the factor that puts people at risk of criminal justice involvement, ignoring the racial bias in drug policing and prosecution in the United States that leads African Americans and Latinos into long-term criminal justice supervision at much higher rates than their white counterparts. Generally speaking, detailed and current data are lacking in almost all the Latin American countries studied, and independent evaluations are scarce. The model is more advanced in three countries (Chile, Mexico, and Costa Rica) and in a pilot phase in four others (Argentina, Panama, Dominican Republic, and Colombia). Ecuador and Peru are also considering whether to establish drug courts. Many programs carry harsh penalties as sanctions during the course of treatment. In contrast to the US experience, Latin American drug treatment courts graduate few participants. The drug courts in the region most commonly address crimes against property, domestic violence, and drug possession. Based on available information, simple possession is one of the most frequent crimes in drug court programs that include drug offenses (those in Chile, Dominican Republic, Mexico, and Panama). Much as in the United States, participation in Latin American drug courts typically requires that participants remain drug free and sometimes sanction them for positive drug tests. Most countries clearly lack the capacity to provide appropriate treatment to all program participants. Much as in Latin America, detailed and current data are lacking in almost all the Caribbean countries studied, and no independent evaluations of drug courts have been done. The information available is mostly from government sources. The drug court model is more advanced in three countries (Bermuda, Jamaica, and the Cayman Islands) and in an initial phase in three others (Trinidad and Tobago, Barbados, and Belize). The Bahamas seems to be interested in establishing drug courts. The information available suggests that few participants graduate from Caribbean drug courts. The drug courts in the region most commonly address crimes against property and drug possession. Based on available information, simple possession is one of the most frequent crimes in drug court programs that include drug offenses. Participation in Caribbean drug courts typically requires that participants remain drug free, and they rely on drug testing to assess compliance, with sanctions imposed for positive drug tests. Information about treatment standards and options available is scarce, but our research suggests most countries in the region lack the capacity to provide appropriate treatment to all program participants. Any serious attempt to provide an effective alternative to incarceration should start with the decriminalization of drug use and possession for personal use. This will facilitate access to voluntary treatment by removing the fear of arrest. In the interim, governments should take measures to ensure drug dependence is treated as a public health rather than a criminal issue and to minimize the impact of criminal justice involvement and discrimination faced by people with drug arrests or convictions. In the report we recommend health-oriented approaches to drug use and dependence as well as alternative approaches to criminal justice involvement that may help move countries toward these goals. In countries in which drug courts are already in place and embedded in the legal system, we also recommend that changes in the areas of legal framework, treatment provision, mitigation of potential harms, guarantee of fundamental rights, and monitoring and evaluation be considered to mitigate unintended negative consequences of their operation. Drugs, Security and Democracy Program. Drug Courts in the Americas. New York: Social Science Research Council, October 2018. Drug Courts in the Americas (New York: Social Science Research Council, October 2018).